St Ives: Being the Adventures of a French Prisoner in England is set during the Napoleonic Wars. The hero, St Ives, is a French prisoner of war being held at Edinburgh Castle. In prison he is known as Champdivers (his mother’s family name). The beautiful Flora Gilchrist often comes to visit the French prisoners. The two become closer with each visit and St Ives begins to fall in love. In prison, St Ives befriends the English Major Chevenix. He is plagued, however, by another prisoner, Goguelat. Guessing at St Ives’s feelings for Flora, Goguelat insults her. St Ives challenges him to a duel, and using scissors for a blade, wounds him. Goguelat later dies from the wound, and the guards question the prisoners over the murder. Chevenix realizes St Ives was involved, but believes St Ives when he insists it was an honourable fight. One day a lawyer, Daniel Romaine, comes to visit St Ives. St Ives’s full name is Vicomte Anne de Keroual de Saint-Yves, the great nephew of the Count. His cousin, Alain de Saint-Yves has long been designated the heir of the Count’s estate. However, Alain’s penchant for mistresses and gambling and most importantly the fact that he was acting as a spy, have convinced the Count that he is an unworthy heir. Romaine tells St Ives that the Count wants to meet him and will make him the beneficiary of his estate. He gives St Ives some money, and tells him his uncle is at Amersham Place, near Dunstable. Meanwhile, the prisoners have been plotting their escape from prison. When they break free, St Ives immediately goes to visit Flora at her home at Swanston Cottage (where RLS and his parents often stayed). Flora and her younger brother Ronald do their best to hide, clothe and feed him. Unfortunately, their Aunt wakes up and they explain everything to her. Although she is angry, she agrees to help St Ives. Aunt Gilchrist arranges for two drovers, Sim and Candlish, to guide St Ives to the English border. En route, they meet with men who have long been feuding with the drovers. The men attack and St Ives stabs one, Faa. He then escapes over the border, vowing to help Sim and Candlish (who will be arrested over the attack) when he can. St Ives now makes his way to Amersham Place. On the way he nearly (and humorously) gets caught several times. When he finally meets his uncle, he finds that he is a cold, calculating man. Nevertheless, he gives St Ives £10,000 and makes him his heir. St Ives is also given the services of a valet, Rowley. Rowley is a foolish, but loyal and enthusiastic boy who quickly gains St Ives’s trust. Romaine now arrives and warns St Ives that he my be in danger from his cousin Alain: furious that he has been stripped from his inheritance, Alain will stop at nothing to have his vengeance. Indeed, Alain has been spying on their conversation and affirms that he will do whatever he can to regain his fortune. Romaine also warns St Ives that the papers have circulated a story about the Edinburgh prison escape. The papers accuse Champdivers of murdering Goguelat and then fleeing from prison. St Ives insists no one knows that Champdivers and he are the same person. Unfortunately, Alain does know, although luckily he has not yet seen the papers. Because Alain will certainly pursue him once he does read the papers, St Ives must flee. He decides to go to Edinburgh, arguing that that is where he will be least expected (in fact, he just wants to see Flora). On the way to Edinburgh, Rowley and St Ives meet with a series of ridiculous incidents. They forget to go by aliases so are almost caught several times. In Aylesbury, St Ives learns Alain has now read the newspaper account of the murder – he and Rowley must be even more careful. Their attempts to be discreet, however, are hopeless, particularly when St Ives buys a claret coloured chaise for them to drive in. The chaise attracts even more attention when St Ives uses it to rescue a young girl from marrying a man she doesn’t love. 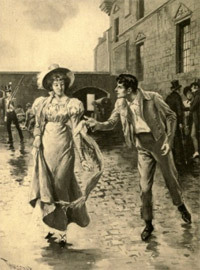 He flees with her in the chaise while the man chases and shoots at them. Luckily, St Ives manages to sell the chaise to avoid arousing more suspicions about his identity. At last, St Ives and Rowley arrive in Edinburgh. They rent rooms from Bethiah McRankine, a religious woman whose bark is worse than her bite. While in Edinburgh, St Ives meets some curious characters. For example, he meets Dalmahoy, a “cheerful extravagant”, the members of The Six-Feet-High-Club, and an aeronaut, Byfield. At last, St Ives visits Flora. He tells her all about the duel with Goguelat, and gives her most of his money for safekeeping. The couple also become engaged. St Ives now meets with Robbie, the lawyer. Wishing to make restitution to Sim and Candlish, St Ives explains about attacking Faa. Robbie investigates and learns that Faa has recovered. He also arranges for Sim and Candlish’s release from prison. St Ives now turns to the matter of Chevenix. Seeing Flora at the prison so often, Chevenix has also grown fond of her. In St Ives’s absence, he has been courting her. St Ives’s problems are compounded because Alain has arrived in Edinburgh. A Bow Street Runner (an early type of police officer) is guarding the bank so St Ives has no access to money. When he tries to ask Flora for some of the money he gave her, Ronald and Chevenix bar entry to the house. Furthermore, a description of Champdivers has been circulated in the newspapers: St Ives is sure to be caught! Up until this point, the story is Stevenson’s, who had been dictating St Ives to his step-daughter Belle at Vailima. He never completed the novel, however, and the author Arthur Quiller-Couch provided the final six chapters. In Quiller-Couch’s ending St Ives and Alain confront one another at a ball. St Ives manages to escape and he and Flora meet the next day. Ronald and Chevenix then warn St Ives that Alain is on the way. Byfield, the aeronaut, is just about to ascend in his hot-air balloon when St Ives leaps aboard. The men, along with Dalmahoy, and a curious character called Sheepshanks escape into the sky. They eventually crash into the sea and are rescued by a ship. St Ives gives Byfield a letter for Flora telling her he will return to France and to write him there. In the meantime, he stays on board the ship and sails to Massachusetts. In Boston, the consulate hear his story and give him safe passage to France. St Ives now arrives in Paris and hopes to hear from Flora. Alain finds him and tells him he will be arrested for Goguelat’s murder. Luckily, Romaine arrives just in time – St Ives has been cleared of the murder. Alain must now renounce all claims to the estate and can never set foot in England again. St Ives returns to Swanston Cottage and he and Flora marry. They settle in Amersham place, and await the birth of their first child. Ronald, meanwhile, has joined the army. Image from RLS, St Ives, The Novels and Tales of Robert Louis Stevenson, vol xxi (New York: Charles Scribner’s Sons, 1903).